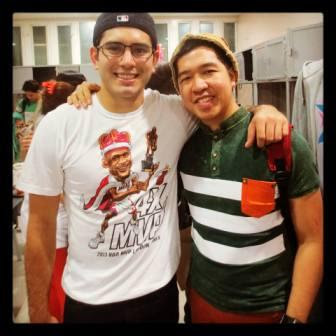 Home Celebrity Celebrity Basketball Celebrity Moments Gerald Anderson Gerald Anderson and Rocky Batara Photos with the Stars PIctures with the Stars Gerald Anderson and Rocky Pose After the Game! For the nth time now, yours truly and the Primetime Action-Drama Prince Gerald Anderson met and mingled in the different events. The latest was during the Celebrity Basketball wherein Gerald was the star player of their team! Right now, Gerald is very busy for his comeback in movie and in TV series. He is leading in the newest Star Cinema action-suspense film "OTJ (On The Job)" with Piolo Pascual. And in the TV series, he is set to return in Primetime via "Bukas Na Lang Kita Mamahalin" with Cristine Reyes and Rayver Cruz. Congratulations Geh-geh! Two thumbs up for your successful career!